Greenwich, CT USA (PRWEB) August 15, 2016. Leading global solutions provider Civicom Marketing Research Services will feature TranscriptionWing™, the leading edge transcription service of Civicom, in their upcoming webinar available several times in multiple time zones from August 23 to August 25. TranscriptionWing was launched in 2005 as an answer to a growing need of fast and affordable transcribing services for Civicom’s existing conference calling clients. Word has since spread and TranscriptionWing now serves various sectors including marketing research, academic institutions, the entertainment industry, and virtually every kind of business organization. Entitled “Abracadabra! 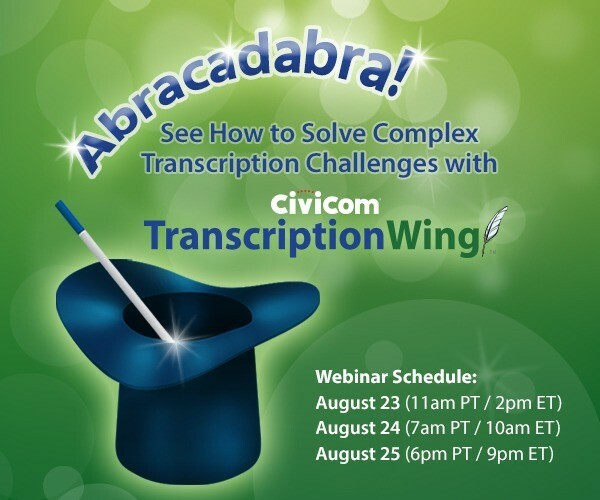 See How to Solve Complex Transcription Challenges with Civicom TranscriptionWing!”, the upcoming webinar will focus on some of the most persistent challenges market researchers face in carrying out a study – procuring quality transcriptions without having to spend too much and making sure delivery fits the timeline. Balancing budget and time is no doubt essential in achieving a well-executed study, and webinar attendees will learn how TranscriptionWing can assist in providing a hassle-free yet cost-effective process for every transcription need. Transcriptions require a level of expertise and time management to prepare, and TranscriptionWing offers the expertise and the capability to deal with even the most challenging recordings and instances. The webinar will also address TranscriptionWing’s flexible customization options catering to clients’ unique formatting needs. The expert transcriptions provider understands that some clients require formats that are more inclined to their branding or aesthetic. TranscriptionWing employs a team of seasoned transcribers and editors to ensure consistency and accuracy, delivering quality outputs in flexible turnaround times that fit the budget. TranscriptionWing™ provides fast, accurate, services with a budget option for cheap audio transcription services. TranscriptionWing™ specializes in general transcription services with fast turnaround times at transcription rates as low as $1.29/recorded minute. Clients can further customize their projects by opting for other services such as time-stamping and labelling speakers. TranscriptionWing is a service of Civicom Inc., a reliable global leader in serving the marketing research community with advanced virtual communications solutions for the world’s top organizations, with a strong industry presence in facilitating virtual IDIs and focus groups, online multimedia boards, and mobile research. Civicom is powered by a combination of proprietary audio conferencing technology, online meeting software, web technology tools, superior recording capabilities, and a proprietary transcription system. For more information, visit https://www.transcriptionwing.com. Civicom Marketing Research Services is a global innovator in qualitative research tools using the latest technology solutions for marketing research. The company works hand in hand with market research firms, facilitating marketing research projects both locally, as well as those with extensive global reach. Civicom Marketing Research Services offers many options to enhance the research process for marketing research professionals. Civicom is the global leader in facilitating telephone and web-enabled IDIs and Focus Groups using Civicom CyberFacility®. Civicom also offers Civicom InSitu® Mobile Research, a qualitative tool to conduct audio diaries and patient journeys. Civicom operates in over 96 countries and offers extensive translation services for marketing researchers, as well as transcriptions through TranscriptionWing™, and respondent recruiting through CiviSelect™. All of these services are available in Spanish, as well as English, as well as other languages. Civicom Marketing Research chooses to be as dynamic as it is innovative; always listening to and acting on clients’ ideas and requests as makes sense. This kind of relationship has paved the way for the development and rollout of new services. To learn more, email Civicom® at inquire@civi.com or call +1-203-413-2423.